Spotify is one of the world's most popular music and video streaming services. Founded in Stockholm, Sweden in 2008, Spotify has experienced tremendous growth over the last 10 years. Since its launch, the music company offers listeners access to over 30+ million songs for iOS, Android and web. Currently, many Spotify users are unaware you can listen to podcast on the music app or they choose to neglect the feature because it's difficult to use and hard to find. I tasked myself to design a stand-alone Spotify Podcast app that would appeal to everyday podcast listeners and Spotify music fans. For the duration of this project, I used lean UX principles to minimize waste and maximize value. My focus for this project was to make the podcasts experience simple, intuitive and easy to use. The final product was a high-fidelity prototype built on Spotify's design guidelines to offer the ultimate podcast listening experience. The new design eliminates clutter, improves podcasts/episode discoverability while offering a refreshed UI. Since 2015, podcast growth has steadily been on the rise. Researchers at Edison Research reported that 112 million Americans have listened to a podcast in 2017. That's an 11% increase from 2016, and podcast competitors aren't backing down. With a more than 10+ podcast apps on the market, everyone is fighting to be number one. Spotify current offers users the ability to listen to podcasts, but it's tucked away under an array of menus, screens, and lists, so not many users are inclined to use it. In order to have the best shot at being the number one podcast service, I thought it would be crucial for the music company to develop a stand-alone app that would focus directly on the podcast listening experience. 1. Podcast are difficult to find. 2. Navigating podcast is difficult. 3. Searching for a specific episode isn't intuitive and involves a lot of scrolling. 4. Ui is too dark and doesn't give a sense of "lightness" to the user. 5. There isn't an option to increase or slowdown playback speed. 6. There isn't an option to forward or rewind episodes. 7. You can't favorite episodes. 8. Podcast listening behavior is fundamentally different from music listening. Quickly find new or saved podcasts and listen to them. 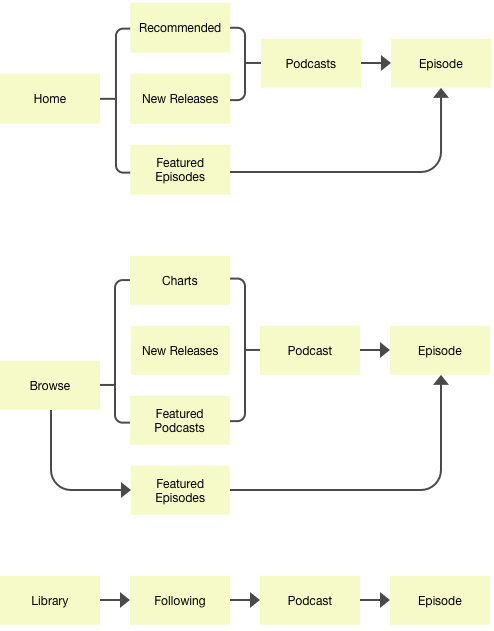 I mapped out the user journeys for the Spotify Music user and compared it to the Spotify Podcasts user to better understand how someone would utilize the both apps. The discovered insights would lead to an improved user experience. I focused heavily on maintaining a similar look and feel to the Spotify app while adding podcast specific elements to the design layout. The areas I focused on stemmed directly from the user pain points with the Spotify app. A greeting message was added to create a more inviting homepage. The message will update based on the time of day (morning, afternoon, and night). The home feed has been modified to showcase the latest releases, recommendations and featured episodes/podcasts based on the users' interests. Users are encouraged to explore new podcasts with left screen swipes and standard scrolling. I chose to go with a with a white background for this app. The color white produces a sense of refreshment and lightness. This also distinguishes Spotify's music app from the Podcast app. I modified the Browse page to target what podcast listeners would want to see when browsing for new podcasts. "Categories", "Featured Podcasts" and "Featured Episodes" have been added to the menu for easy discoverability. Spotify's search feature is straightforward and has a built in search history. I felt that this worked well and did not need to be redesigned. It wasn't necessary to have a radio station in a Podcast app, so I replaced it with a podcast menu. Users can immediately view all the podcasts they subscribe to and keep track of their favorites, follows, and listens. Spotify's Library menu is quite extensive and doesn't have an option to be customized in case you don't use all the features. In the Podcast app, I've reduced the list size to 5 items: "Episodes", "In Progress", "Favorites", "Completed Episodes", and "Downloads". Libraries are places to find sources of organized information. With the new library feature, there won't be any confusion about where you can locate downloaded episodes because it's in one centralized place. I've also added a miniature podcast menu for users who want to quickly find a subscribed podcast once they're in the Library menu. Research shows that most podcast listeners enjoy podcasts early in the morning (7-8 a.m.) or later at night (11p.m.). Morning listeners are typically commuters who synonymously catch up on news and check the weather during this time. Adding a mini news feed and weather function in the home screen could potentially make this app a great choice for morning enthusiasts. This feature would also have the option to be disabled in settings. What makes Spotify so appealing to people is their extensive music collection and ability to create custom playlists. By providing users with a extensive podcast library and the ability to create custom podcast playlists using episode filters would add delight and usability to this app. This project definitely lived up to my expectations as a designer. I was able to challenge myself in new ways to create something people all over world and myself could potentially enjoy. UX Designers are problem solvers, and I believe this project identified some challenges for Spotify and solved them in a new way. I hope you enjoyed this as much as I did! © 2019 Kevin Libertino — All Rights Reserved.